When former Gourmet Magazine editor Ruth Reichl was asked to list her 5 favorite food books a while back, she responded that they were AJ Liebling’s Between Meals, MFK Fisher’s The Art of Eating, Lappé’s Diet for a Small Planet, Pelligrini’s An Unprejudiced Palate and The Alice B Toklas Cookbook –– yes, The Alice B. Toklas Cook Book. It’s a great book –– and not just because of those infamous brownies that have made it one of the best selling cookbooks ever. Hers is one of those cookbooks that inhabit the rarified atmosphere of the highest plateau of the genre. She is a great storyteller with great stories to tell –– plying us with her tempting recipes is frosting on an already great cake. 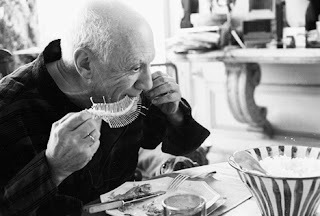 Let’s face it, don’t you want to eat like Hemingway and Picasso? 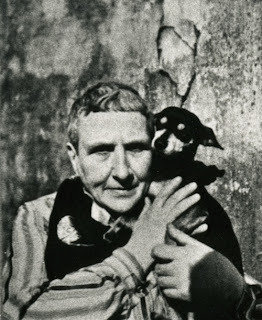 About her brownies –– in fact, they were not really hers but a recipe shared with her by the polymathic genius Brion Gysin and they were not brownies at all, rather they were canibus-spiked, spicy fruit-nut “ Haschich Fudge” candies. They are even more scrumptious when imbibed with Toklas description: “This is the food of Paradise –– of Baudelaire’s Artificial Paradises: it might provide an entertaining refreshment for a Ladies Bridge Club or a chapter meeting of the D.A.R. . In Morocco it is thought to be good for warding off the common cold in damp winter weather and is, indeed, more effective if taken with large quantities of hot mint tea. Euphoria and brilliant storms of laughter; ecstatic reveries and extensions of one’s personality on several simultaneous planes are to be completely expected." I bet that got you to sit up and smile. The whole book is full of the charm of a mythic lost world of meals shared with practically every genius who every traipsed through Paris –– writers, artists and intellectuals all stopped at their salon at 27 rue de Fleurus. 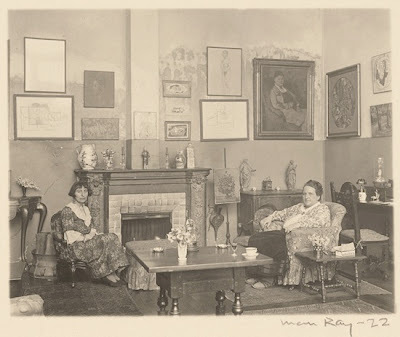 They stopped to see Gertrude Stein and Alice B Toklas and most of them stayed to dinner (and left masterpieces in gratitude). This is extraordinary for so many reasons. Stein was not rich, she was certainly not beautiful, their home was not magnificent (even if the art on the walls was). She was in love with Toklas and they lived together happily as man and wife for 40–odd years. Still, everyone came to them and mostly loved them, sometimes fought with them, were nurtured by them and were often supported in small ways by Stein who bought and bought to keep artists alive and fed –– they were fed at rue de Fleurus, very well fed body and soul. The formula for the book is straight forward even if the content is deliciously eccentric. There are chapters on homecooked French food, American Food (that was eaten on a 1934 literary tour of American cities and included Wild Rice and Oysters Rockefeller). There are “Treasures” like Omelette in an Overcoat and Mutton in a Dressing Gown and “Little-known French Dishes” like Chicken in Half Mourning and Frog’s Legs á la Parisienne. These are delightful to be sure, but then there are the chapter titles like “Murder in the Kitchen”. In “Murder in the Kitchen” you find actual dispatching of finned and feathered creatures and plotted (but not executed) murders of a succession of unpleasant kitchen personnel at rue de Fleurus. An exception to the usual vile cadre of chefly monsters would be the tenure of Frederich and his Viennese pastries that ended when he ran away with a devil woman (he explained his madness by saying he came from the same village as Hitler and everyone was crazy there). A very curious assertion to be sure, but his pastries were divine and so are the recipes for Sacher Torte and Linser Torte (he had worked at Hotel Sacher’s Restaurant in Vienna)! “Dishes for Artists” is where Toklas describes the mayonnaise enrobed wine-poached bass she made for a lunch with Picasso. It was decorated with red and regular mayonnaise (the red comes from tomato puree) and designs of grated egg, truffles and herbs. 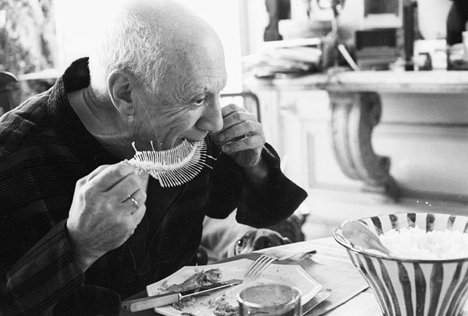 Picasso was impressed –– even if he felt it was more to the style of Matisse than Picasso! One of the last chapters is “Recipes from Friends” and you can imagine what friends there were. So many names are gone and untraceable that once had been familiar. But others like Cecil Beaton and Virgil Thomson , the notorious Mercedes da Acosta, Pierre Balmain, Sir Francia Rose and Carl van Vechten were among the dozens of friends represented. The book is so much fun, that I am breaking up the post into 2 parts. This week with a brilliant salad from Stein/Toklas pal Mary Oliver and next, Toklas’ famous eggs in a recipe given her by painter Francis Picabia –– the buttery eggs of the gods that have lured many to the brink of cholesterol shock. Ms Reichl swoons over them. Still on an egg roll, I may do one more of her egg recipes for you, they are terribly good. The recipe for the July 14th Salad appealed to me because of the use of the nasturtiums in the salad –– I love the taste of them. After having gone gardenless for a few years, I now have a small potted garden of herbs and edible flowers and have been rejoicing in a culinary way by using them as often as I can without critically denuding my stock. You might have noticed that I have been using a lot of flowers lately in my dishes –– now you know why! This time I was thwarted by Mother Nature. As I was all ready to go with the recipe, there was a bizarre rainstorm that shredded my nasturtium flowers. Were that not the case, there would have been more in the photos of the dish and that’s how I would recommend you make it. The pepperiness of the flowers (especially the spent flower buds) are fabulous in the salad. I used the not very pretty but delicious flowers on mine after the photos and loved it. a few chives chopped and some left whole for garnish. Put the oil, vinegar, garlic and salt and pepper in a jar with a lid and shake for a few moments (or whisk like mad). Pour this over the cucumbers and nasturtium leaves and let sit for a few moments. To serve, place the cucumbers/nasturtium mix on a plate, top with the fish and garnish with extra nasturtium leaves and lots of flowers. Whisk the lemon and water with the egg yolk. Begin adding the oil a drip or 2 at a time (I used an old Cuisinart pusher with the drip hole… worked like a charm). Keep whisking madly until it begins to look like stiff store-bought mayo and they you can add the rest of the oil a little more quickly. I used less oil since I wanted a stiff mayonnaise. The mustard and paprika are added as per Toklas… this is how she made mayonnaise. "To a pint of mayonnaise add capers and chopped dill pickles. Mix well with 1 lb boned white fish. Serve with a salad of nasturtium leaves and cucumbers with a dressing of olive oil and garlic mixed with tarragon vinegar. Garnish dish with nasturtium leaves and orange and red nasturtiums. With this should be served chilled chives, or a cider cup with raspberries and cucumber rinds." Interesting post as always with masses of info. I used to use nasturtiums a lot in salads but they not grow very well here :( I must try again. I too am growing nasturtiums..calendulas,pansies, herbs,and can't wait to do things with them..My calendulas were started from seed in the house..I am in love w/ mine..and I love the way nasturtiums photo:) I am so happy for you that you've made a garden..Look what you did! 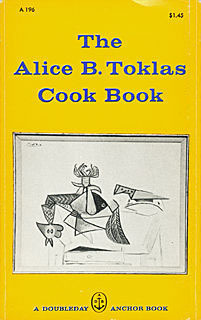 I have never read Alice's cookbook and actually downloaded it after going to the recent Stein exhibit at the Met. You've inspired me to get started reading. Also thanks for the info on nasturtiums - I knew nothing about how to use them, or their taste, but I've been eying the beautiful blooms at the farm. I promise to become more adventurous! Wishing you a wonderful 4th! Oh my, I have to get that book! Adore this book not sure if it is the tales of life or the recipes, but I just adore it. Would like to point out that although Stein was not 'rich' she wasnt exactly poor either. And as someone who has been living with my also female partner, albeit a mere quarter of the time Gertrude and Alice did, I must correct you, we are not living as man and wife, we are just living together. Your photos always have such a dream-like quality, Deana. What a life they had, the company they kept. Good for you for remembering them and a wonderful recipe from Alice's cookbook. Came across this blog via my Google Alert for phrase "play bridge"--I published a book, and have a blog about, playing sociable bridge and ladies bridge lunch. I found chopped green pepper tea sandwiches were a staple of the ladies lunch in early part of the 1900s. My gosh, another Toklas friend (Faria Marinoff of NYC) contributed a sophisticated version of that sandwich to the Toklas cookbook! Minced or ground green pepper, raw spinach, watercress, parsley, green onion tops, combined with dill, thyme, tarragon (fresh if possible) and the butter or mayonnaise to create a spreadable filling. If I were a NYC caterer, in this health-obsessed age, I'd offer that as the Toklas Tea Sandwich (would have to work out amounts of each ingredient of course). Incidentally, first time I read this blog you referenced under "you might also like" a 1913book on chicken salad and ladies lunch--now, that reference is gone! How can I see that link again? Just in case I live long enough to do a revised edition of my Bridge Table or What's Trump Anyway? book--Im 92 and struggling just to finish up 52 blog posts (a bridge deck is 52)before I succumb to senility. My only complaint about your wonderful website is that white on black graphics! Is that ever hard on old eyes. Anonymous. Stein and Toklas referred to one another as husband/hubbie and wife/wifie (and lobster, mount fattie, cake and fattuski). Their word choice, not my description. I started reading your post because I was thrilled to find someone else who uses nasturtiums in salads! Just the very thought of bringing those "special" brownies to my local DAR event is enough to give me paroxysms for a week. (-: Thank you for a wonderful post and a good laugh! OK, this is the way to write a cookbook: about friends, about the LIFE behind the meals and the RISKS that people took to be DIFFERENT and TASTE, I mean, really TASTE the food and life. My dear, those BROWNIES!!!!! teeehee...I think some of my high school friends may have read this book or got wind of this recipe somewhere!! I love how Stein also supported artists to keep them feed and working. Now we look at these lives and some of us just look at the glamor they left behind, while in their time, they were JUST LIVING. I wonder what future generations will say about US...WHERE WE LIVING for the ART OF IT? AND you love belugas TOO????? Don't you just love them and those silly pinpoint eyes of theirs that hold so much beauty within? I so agree that if people would just REACH high but also down DEEP, maybe selfish decisions would be thought about twice. Oh to dream....NO...TO LIVE IT, TO MAKE IT HAPPEN so that our recipes for life will one day be someone's inspiration. What a hoot. Had no idea there was such a cookbook. You've made it such fun, too, Deana. Such a world they had, filled with characters. One reads so much about those days, but never a mention of a cookbook that I remember, but then I'm not as well read as you. Great salad...my mother adored nasturtiums. Made a butter with them and also put them in salads. I remember stopping at a roadside stand up at Walloon Lake in Michigan and buying bunches of them for her. what a wonderful combination of flavors in that salad, and I never knew that about nasturtium. On another note, I would love to serve those brownies at one of my sister in laws DAR meetings just for fun! Who wouldn't trade something precious to be a guest at one of those dinner parties. Awww now I have to go and find a copy of this book. Your post got me hooked. BErnini threw me for a loupe there. Really lovely post. Kind of makes me want to visit, like the guy in Woody Allen's film. Deanna, I'm trying to get a line on a cooling collar for poor Petunia, from a friend with a whole mess of dogs. I'll let you know when I find something. Canibus-spiked, spicy fruit-nut “ Haschich Fudge” candies sounds intriguing. I'm sure it's worth the trouble... The salad is gorgeous! I should grow nasturtium too. I hate to admit this but Gertrude Stein has always been one of my least favorite writers. 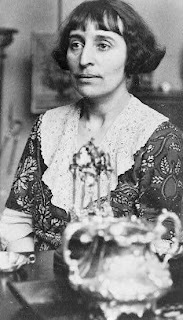 I could barely slog through what I felt was her dense and dry prose in grad school ... so for that reason I believe I have unfairly ignored Alice B. Toklas, but this post has made me reevaluate that 1000%, Fascinating, I am sure I would love the cookbook!